Founder Michelle Berry had a passion for food ever since her grandmother let her stir the pot each time they prepared their famous “Guyanese Style Pepperpot” for family occasions and celebrations. In high school, Michelle began to prepare nightly meals for her family, creating her own dishes, exploring different ingredients, and perfecting dishes that have been passed down her family for generations. It was not long until Thanksgiving became “her” holiday leaving the planning, creating, and executing entirely in her hands. She discovered her love for baking at a young age from the family owned bakery in Guyana. Each holiday creating a new dish that captures the flavor and spirit of the day. Her macaroni pie became a staple at family gatherings and in the households of families she began to sell to. With simple beginnings, her passion for cooking, baking, and creating ignited. Shelley’s was born to fill a void in the industry. Being healthy will never go out of style, and just because a party is thrown or a dinner is served does not mean we need to sacrifice our health or our enjoyment in the food. People can both eat nutritiously and enjoy what they are eating. Shelley’s focuses on food that is both good and good for you, providing an enjoyable, guilt-free experience for our clients and our guests. 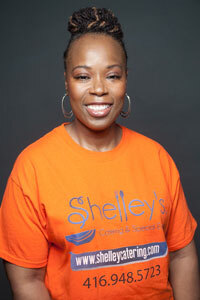 Shelley’s will provide every client a custom experience with quality ingredients and quality service. It shall be the mission of Shelley’s: a catering company to use the finest ingredients to prepare tasty, made-from-scratch products for our clients. Innovative recipes and event planning styles will compliment the healthy, flavorful products tailored specifically to our clients’ needs.